Matudnila.com - A Cebu Events Blog: The Balamban Liempo of Cebu! Home Mactan Island The Balamban Liempo of Cebu! The Balamban Liempo of Cebu! Dubbed as "Tastier than Lechon!" I am with other 11 Cebu Bloggers when Balamban Liempo invited us to conduct a Food review with their main course "Balamban Liempo". Well pictures speaks louder than words(As this is a Photoblog) But I cant help to say something regarding their Liempo. Their Liempo is grilled in "Balamban-Style". Balamban, located at Western part of Cebu is known for its distinct method of grilling Liempo using distinct Local Herbs and traditonally discovered spices. Aside from the hungry-stimulating smell as it pass by in front of me, It could really make one's diet be forgotten. You can taste the crunchy sensation of the "skin" and the juicy entity of the meat. Plus! the spices! that makes me wonder what are those. We'll as far as other Liempos are concern, They are comparable to Siong Sohnn's Liempo (located in Mactan) minus Balamban Liempo's Spices. Overall Food Level is 8 out of 10! 2. Salinas Drive, Lahug infront of USP Lahug c/o Dhara’s Tapsilogan. 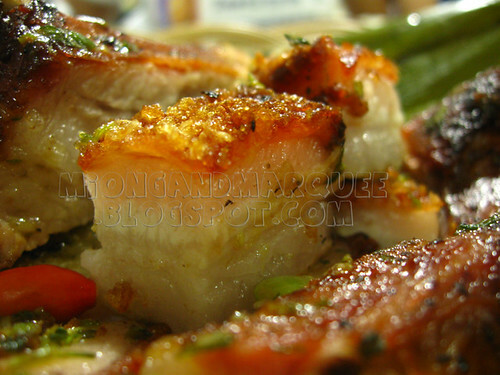 4 comments: on "The Balamban Liempo of Cebu!" tsk tsk. gutom dah. sayang wala ko kauban ana. ahahaha. basin ad2 mag birthday si atty.hehe kaon ta ana did2.